Scenes 1-10 — M. Duval’s country estate, in France. Day. Jean, the gatekeeper, protests to his master that he did see a convention of awful monstrosities disporting themselves, and that there should be a law to smother such, — such things — smother them at birth, or else lock them up. Duval soothes that, if there are such on the grounds, they'll have them removed. The freaks play in the grass on M. Duval's country estate. The selection of freaks used in the film differs somewhat from what is called for in the script. Mother Tetrallini, a vigorous, normal, motherly French woman, wades in the brook with the turtle girl, who has flippers instead of hands and legs! Into the scene comes Jean's angry shout, commanding them all to get out! Do not they know that trespassing is the same as stealing? The freaks gather close to Mother Tetrallini, as she answers. But, M’sieu, they steal only the sunshine? That is no matter: they must get out! Duval restrains his servant, and explains, more kindly, that the grounds are private. The woman is sorry they have annoyed. These are the children of her circus. Oui, M'sieu, most of them are really only children. It is so hot in the tent, and there is rudeness in so many eyes, so she brings them to play in the sunshine whenever she can. The gentleman is sorry. Will Madame please forget what was said, and come as often as she likes. He will remember, at the next circus, that the freaks are really only children. He calls his servant away, and the freaks chorus a “goodbye” with Madame. But Madame scolds her children that they were afraid. Has she not told them that God cares for all his children? But where are Hans and Frieda? Little Angeleno must find them and bring them back at once. 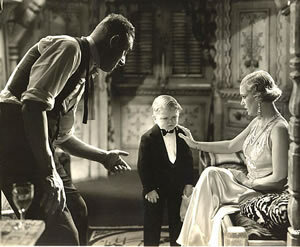 Two faultlessly formed and faultlessly dressed midgets are Hans and Frieda. She sits above him, on a branch which a boy would clear at a bound, and it is very plain they are deep in love. Angeleno breaks the spell, and the Human Skeleton lifts the little lady to the ground. Hans would lag, but Frieda scolds gently, that till they are married the circus comes first. He tells her that it will he soon, now, and then they will live in a vineyard and be very happy together. Scenes 11-57 — The Circus. Night. 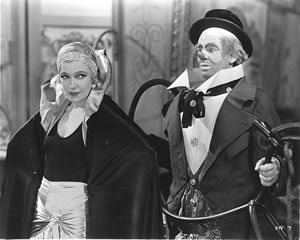 Cleo tries her stuff unsuccessfully on Phroso the clown, a scene which was cut from the film. See Footnote 3 for more on this. Venus, who works with a trained seal, leaves her wagon and enters Hercules', and starts supper before he enters. When he comes there is a quarrel, in which we understand she has been his mistress. (See Footnote 4) But she walks out on him when he would farm out her favors to other men, for his own profit! (See Footnote 5) She is wildly angry, as she passes Phroso, and vents on him her hatred of all men. Still in makeup, he shows no reaction for the instant. But he digs the makeup off in a jiffy and storms to Venus' tent, and tells her a few things. She sobs, and he softens and tries to encourage her, and in another moment they are anything but hating each other. We see the Siamese twins, Rosie and Mamie. (See Footnote 6) We see that the man, Roscoe, is the "maiden" rescued from the bull, and learn that he is engaged to Mamie. Phroso banters with the twins, who are connected, that Rosie, even with her eyes shut, knows when Phroso pinches Mamie’s arm or cheek. Roscoe sees, and rages. Somehow we wonder if Rosie will react to all of Mamie’s experiences! Hercules sings, as he passes Cleo’s wagon, and looks in when the woman applauds. He is easily coaxed inside. She bids him to supper and manages, as she moves about her stove, to drop her already scanty covering still more seductively. It works. She is in his arms, and her protest, as she clings tight, is but more maddening invitation! He is a strong man: she is a voluptuous and willing woman! Scenes 53-71 — The Circus. Night. Mme. Bartet's rolling estaminet is parked near the circus, and Tetrallini drinks — and too much — with the proprietress. Many of the freaks are about. Hans and Frieda sit together, but he plainly pays no attention to what she says. She notices it, and chides him for it. He is sharp at first, and then contrite as he realizes his sharpness has hurt her. There is general gossip regarding Cleo and Hercules. The affair has been growing. In the moment, Hercules comes and pays cash for two bottles of expensive wine. Tetrallini's eyes widen, for she knows whence comes the money. The strong man hurries away to his carnival of love! Tetrallini commands her charges to their beds, and they obey her. Scenes 72-84 — The Circus. Night. Gold-digger Cleo awards Hans a kiss for the flowers and the 1000-franc advance. This is during the performance, and as Cleo makes her exit she pauses to thank Hans for the beautiful flowers — and for the loan of another thousand francs, "till her money comes from Paris." Hans agrees, eagerly, and is hugged and kissed for reward. Cleo passes Phroso, and stops as if for some advance. Venus sees, and understands, and confesses to Phroso that it makes her jealous. Venus is disgusted when her plain opening leads to nothing personal. She even mocks him when Phroso speaks to Schlitze, the pin-head idiot girl, who watches him adoringly. Cleo and Hercules, in her tent, laugh over the basket of expensive fruit Hans has had sent to her from Paris, and speak of the "Little Ape". She'll suggest champagne, next, for she doesn't care for fruit. There is a knock, and the answer that it is Hans. Cleo calls her thanks to her "darling" for the fruit, and pleads that she is at her bath and cannot admit a gentleman. Can he come again, later? Hercules sprawls on her bed, convulsed with laughter. Cleo throws her arms around the man, perhaps only to stop his laughter, lest Hans hear and the game be lost. But Cleo's body covers the body of the man! He is a strong man, and she is a voluptuous woman! Scenes 85-94 — The Circus. Morning. Venus comes from Phroso's wagon, with his freshly darned socks. She tells him that she has been staying in lately, and when he suggests she has been catching up on sleep she continues, significantly, that a girl needs more than sleep! He doesn't take it up, and she snaps that it doesn't do a girl any good to be good. He doesn't even know she's alive! It reminds Phroso that he dreamed he saw her in a bathing suit, on a rock, like a statue, and that her figure looked great. Does she know she has a good figure? She thrills, but he abandons the thought and hands her a stuffed maul to hit him with, as part of a new stunt. She does, and with all her strength, and his head pops down into his jacket, out of sight. She is unmoved when he reappears, and he snaps at her that she'll see their audience roar at it. A freak approaches with the news that the bearded lady's baby has been born, and they all hurry to pay homage to the newest member of their family. Looks funny, though, to see a proud new mother smiling through a beard! Scenes 95-107 — The Circus. Day. Cleo is practicing in the main tent, and the men are baiting Hans by ribald remarks concerning her which burn his little soul and yet only amuses the woman. She comes down and sits with Hans, then complains of a lame shoulder and has him to rub it for her. She directs his hands to as intimate places as she dare, and the men roar with laughter. Hans cries that they are filthy rats, and during the scene Cleo escapes, to hide her own laughter. Hans follows her out. Venus chats with Frieda, as the little lady bustles about her washing. At first Frieda pretends not to have seen Hans’ infatuation for Cleo, but it is too much, and she confesses her worry. But the coming of Phroso distracts Venus' attention from the midget. In the meanwhile, Roscoe and Mamie have been married, and there is [a] strange domestic complication. The twins are making the bed while Roscoe finishes his dressing! Mamie remonstrates with Rosie for mocking Roscoe's stuttering. In answer to something we have not heard Roscoe asserts that they'll do as he says, for he’s boss of his home. He doesn't want the tramps who go with Rosie to be hanging about Mamie! And Rosie’s gotta cut out getting drunk every night: he doesn't want Mamie in bed half the days with Rosie’s hang-overs! Rosie demands that she and Mamie get out, and when Roscoe would forbid she insists she's got to go! The man gives up. Rosie's always pulling that one! As they walk away Rosie promises her sister she won't do it any more. Scenes 108-126 — The Circus. Night. After the show. 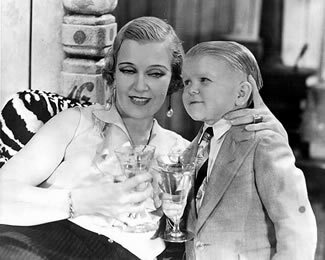 Cleo and Hans drink to "the most beautiful woman in the world." Cleo is fully dressed and is not in negligee as was originally planned in the script. Cleo sprawls on her bed in negligee (see caption at right), while the immaculately dressed Hans pours her a glass of rare wine he has brought for her — the most beautiful woman in the world! Venus leaves her wagon, and Phroso, before he sees that she is dressed to go to town, reminds her that he was right about the gag he said would go over big. The scene shocks us, for Phroso is in his bath tub, and seems not at all embarrassed, when Venus looks down on him! She protests that all he thinks about is his clowning, and he admits that he thinks always of his big act which he will take back to America and which will win his fortune. We are relieved, when we see that his tub has only sides, and he is really working on a prop for a gag. But Phroso insists that he is human, and that’s why he works so hard to reach a position where he can give a wife and kids all he would have them to have. It hits Venus hard, for she thinks it means another woman on his mind. He notices she is dressed to go out, and she snaps she is tired sitting around like a sap. She's going to town and look for a couple of sailors! Phroso tells her to get four and have a regular time, adding that sailors don't care! Her rage chokes her words as she slams back into her wagon. Roscoe has seen, and approaches with sympathy. Women are all alike. 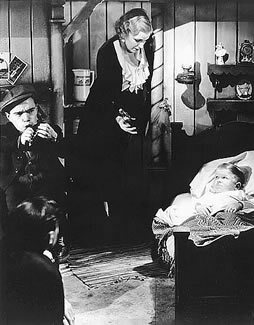 There's Cleo, now, in the door of her wagon, saying good night to little Hans. Roscoe says Cleo must be on a diet, and Phroso laughs. Venus hears, and thinks the laugh is at her. She shouts that she admits she is a sap, but she thanks Phroso for opening her eyes! Roscoe marvels that Phroso stands for letting that tramp bawl him out, whereupon Phroso leads him away from Venus’ wagon and knocks him cold! Frieda follows Hans hesitantly into his wagon. It is hard for her to say it — it is about her. Hans is sorry that Frieda is hurt, but Hans cannot help it. Yes, Frieda, he is happy. She begs that Cleo cannot make him happy, and that she even laughs at Hans, with the others; but this Hans refuses to believe. Frieda forgives Hans for the hurt he has given her, for she wants more than all else for him to be happy. No, Hans, she will not worry about you any more. But we know she lies, and we bless her for it. Scenes 127-133 — Cleo's Wagon. Night. Cleo and Hercules gloat over the necklace Hans has given her. They wonder where he gets his money. They got five hundred for the bracelet, and this should fetch a thousand! She thinks she'll want a fur coat next. She laughs when Hercules says Hans seems to have ideas about her, and says he'd squash Hans like a bug! There is a knock, which must be Hans, and Hercules is sent behind the curtain till he is disposed of. But it is Frieda who enters. She has come about Hans — because he is in love with Cleo — because they are all laughing at him. She knows Cleo is just making game, but Hans doesn't know it, and when he finds out he will be always unhappy. Cleo taunts that maybe she'll even marry Hans, and Frieda reminds that, does she so, they will then laugh at Cleo. But Frieda mentions other results than novel publicity for the normal wife of a dwarf and Cleo shudders and orders her to go. She’d marry Hans even if he had mule's blood! So? Then it's for Hans’ money Cleo lures him? He has told her of the fortune he inherited? And he told Frieda he would tell no other while they were in the circus. Cleo catches the play and feigns wonder that Hans told Frieda of it. She taunts that Frieda must come and see them some time! And poor Frieda is driven into retreat. Hercules comes from hiding, and they wonder at Hans' wealth. The woman muses that she could marry the midget — and then he might die! Midgets are not strong, anyway. Yes — it could be done — slowly! Scenes 133-171 — The Circus. Night. 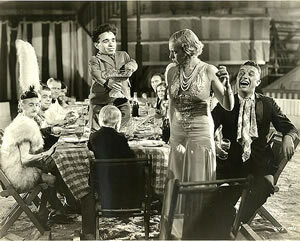 All the freaks and most of the normals are at the great feast in the big tent, but there are a few absentees. (See Footnote 7) Phroso, in his wagon, finishes making a poster for himself, and calls for Venus to come see it. An acrobat says Venus went out an hour ago, and left the message for Phroso that she had gone to look for four sailors! Cleo, the bride, sits at the right of the tiny bridegroom, with Hercules on her other side. Freaks line the table, and little Frieda is at the far end. There is a whim to give a show for the newlyweds, and Roscoe would do a dance with his wife. But the other half of his better half holds to her chair and cries there is no better half: they're both the same, and the crowd yells with ribald laughter. Cleo, half drunk, yells for more wine and more music, then turns to ask if Hans is happy. He pats her hand and assures her of his content, and they argue which is the luckiest. Cleo kisses him. Cleo is so happy she could kiss the whole world! Yes, even Hercules — the homely brute! And she does it! Hans begins to look a bit embarrassed. Roscoe declares that they'll all kiss the bride, but Hercules forbids. He'll kiss her for all of them — once for each. They go at it, with Cleo responding ardently, and Hans' state grows worse. He sees Frieda's pity, and it is yet worse for him. Cleo sinks into her chair, after the debauch of kisses, and wishes the night might last forever. She reaches for her wine, but Hans stays her hand. Yes, Cleo is his wife, but when she drinks so much she forgets it! She roars in vicious glee that he is jealous. But he must not worry: there's more of her than he can ever use! Frieda, tears streaming, leaves the scene, and Hans sits frozen in his shame. "One of us! One of us! Gooble gobble, gooble gobble!" The freaks chant this bizarre line over and over as Angeleno offers the loving cup to Cleo. Roscoe diverts for a moment by shouting that they'll initiate the bride, and Angeleno adds that they'll make her really one of them. The freaks demand a loving cup, and Angeleno quickly contrives it of a fruit bowl which he fills with wine. It passes from freak to freak, and mouth to mouth — and some, like the pin-heads, drool into the drink. (See Footnote 8) Cleo watches in horror, and Hercules laughs. At last the cup comes to Cleo, and automatically she takes it from Angeleno's hands. The freaks shout for her to drink, for they accept her as one of them! Scenes 172-173 — An old French Tavern. Night. Venus sits alone, and it is already long past closing time. The proprietor ventures that he must close up, and refuses the one more drink Venus begs. She rises in drunken dignity and anger. She hopes all his daughters will have broken hearts, and all his sons be clowns! Scenes 174-189 — The Circus. Just before dawn. Phroso sits on the steps of his wagon, watching for the return of Venus. Hercules and Cleo try to convince Hans that their humiliation of him at the wedding feast was only a joke. There is argument in Cleo's wagon, where she and Hercules labor to convince the midget that they were only having a little fun, and that there is really nothing between them. Hans is bitter with himself — not with them. He blames none but himself. He should have known he was a fool, and they were only laughing at him. Always it is that he is laughed at. He falters — falls — he is unconscious! Hercules whines that Cleo has given Hans too much poison, but she insists she knows what she is doing. They neither see little Angeleno as he peers in, but Angeleno sees it all! Cleo starts for Hans’ wagon with him, and Hercules reaches for more drink. Venus, returning, sees Cleo carrying Hans into his wagon, but is not herself seen by the other woman. Phroso sees the woman for whom he has waited and worried, and starts toward her, but pauses as Venus stops to look curiously into Cleo’s wagon. Hercules sees her and tells her she should have been at the feast. Now she must come in, and he will tell her about it. She does enter Cleo's wagon, with Hercules, and Phroso sees and regains his own wagon dejectedly. Hercules offers Venus rare wine, and gloats that the "little worm" has whole baskets of it. Venus does not take the drink. She hadn't thought there was a thing in the world as low as Hercules, but now she knows that Cleo is even lower. She is gone before the man can move. Scenes 190-195 — The Circus. Morning. The doctor tells Tetrallini that it is poison — a very bad case of ptomaine poison. Yes, Cleo did right to give mustard water. It probably saved Hans’ life. Cleo beams righteously and holds Hans’ hand to her cheek. Angeleno, and other freaks watch. Angeleno knows what he knows, and what he does not tell he keeps to himself! Hercules sits nervously on his wagon steps. Freaks pass, and look, and say nothing. Venus passes, and smiles! "He's well liked in the show — isn't he? Too bad if anything happens!" Scenes 196-208 — The Circus. Another day. Cleo, dressed for her act, stops to give Hans the poisoned medicine. A week has passed. Cleo is ready for her act, but pauses to care for Hans first. He berates himself for the things he said that night a week ago, but she begs that it is forgotten, and all that matters is for him to get well again. He pats her hand as she turns to prepare his medicine. His eyes are closed and her back is toward him, and so he does not see the drops she adds from a vial in her bodice! But Angeleno sees, through the curtains! Hans takes the dose! But his eyes are cunning when the woman turns to rinse the spoon! He draws a handkerchief from its hiding and spits the medicine into it! His voice is caressing as he tells her he will never forget all she does for him! She insists she wants to do it, and hurries out for her call — and Angeleno comes from hiding. Hans pops upright — alert! Clearly this is not their first meeting, for they understand what we do not. But we know that something is planned for tonight, and that the freaks will be ready! Hercules is limbering for his act, when Venus passes him. She gestures the forcing of heavy bars apart. She'll bet Hercules could twist window bars like that — prison window bars! It will be fine for him to be so strong, in case anything should happen to the midget! His eyes follow her with hate. Scenes 209-249 — The Circus on the Move. Night. Before the start there is a strange convention of the freaks under one of the wagons. We cannot understand, but their babble is tense! (See Footnote 10) Angeleno seems their leader, and they agree with his plans! Now the caravan is on the move, through the night and rain and mud. One wagon is filled with the freaks, and they babble, "Dirty, slimy freaks!" Can they be mocking Cleo? Why? Frieda speaks nervously to the second man on the driver's seat of her wagon, and bids him bring Phroso to her. Phroso gets the message, and starts forward, beside the train of wagons. Cleo tries again to poison Hans, but this time he and his pals are ready for her. Hans lies very still, so that he seems still to be very sick. Angeleno, and the Human Skeleton, and Schlitze are here. (See Footnote 11) Cleo insists Hans must have his medicine and go to sleep, and the others must go. She turns for the medicine, and when she faces about again, Peter, the skeleton, is stroking a pistol! Schlitze toys with a knife which she has drawn from Hans’ bed! Angeleno shrills on his ocarina, which might serve to quench other noises! Hans sits up alert, fully dressed! (See Footnote 12) Cleo masters her first fear! Hans remarks, drily, that poison must be swallowed if it is to kill. Cleo advances, determined to bluff her way out — and Angeleno goes on playing! Frieda reports to Phroso the strange convention beneath her wagon, which the others would not allow her to join. And also, Phroso, she heard Hercules tell Cleo that Venus knows too much! He cannot quite believe it, but threat of danger to Venus is not to be ignored. Hercules broods in his wagon, comes to some decision, and dons a raincoat. Phroso trudges forward, through the rain and slithery mud, past some of the wagons. Hercules drops from his wagon and climbs to the seat of Venus' wagon, when it passes. He offers the driver a drink, against the toughness of the night, and chokes him to death when the fellow relaxes and stretches his throat to drink! Now Hercules leaves the front of the wagon, and comes to Venus' door! Venus sees the knob of her door move! Silently she gets a pistol! (See Footnote 13) A panel splinters, and Hercules’ foot crashes through. His hand comes, fumbling for the latch! But Phroso sees! He hurls himself at Hercules, and they both roll to the side of the road (See Footnote 14), against a steep embankment! Flashing and crashing from the elements! Horses rear and plunge! A wagon overturns into the ditch — Hans’ wagon! Hercules sprawls over Phroso, choking him, till a heavy wagon crushes over the strong man's leg! He loosens his grip while he howls, and Phroso struggles to crawl away! Cleo struggles from the overturned wagon, and staggers away! Hans and Angeleno, and Peter, and Schlitze clamber after her, and give chase! Phroso comes to Venus' wagon and hurries off to find her in the direction her driver points! Frantic drivers struggle with frantic horses! Cleo runs from the road, with the posse of freaks wallowing after, through the mud! Venus has Frieda safe in her arms, and calls Phroso! Hercules hears the woman's voice and crawls to her! He clutches her skirts to drag her into his murderous grasp! She fights to tear away from her dress! Hans comes out of Frieda's wagon, and continues his search. Lightning topples a great tree, and Cleo is caught under it! Freaks see, and swarm over and through the branches! Horrid, ungodly screams come from the imprisoned woman! A blazing wagon has been quenched, when Tetrallini comes to the men and begs them to come quick, with their lanterns. Freaks scurry away from the fallen tree! Cleo's screams have stilled! Phroso pulls Hans from a ditch, where he has fallen. We do not see Cleo, when the drivers discover her, but we see horror at what they see! They cry for a doctor, and that she must be hurried to a hospital. Hercules drags himself into a wagon, but before he can close the door the freaks see him and are upon him! Scenes 250-258 — Tetrallini's Music Hall, in London. The infamous duck girl publicity still. The ending in the surviving film is drastically different than the original Music Hall ending. The Music Hall ending was originally included in the film, but was cut due to disgusted audience reactions at the test screening. Phroso and Venus are visiting their old friend, and show a photo of Hans and Frieda, with their baby. Yes, they were at the wedding, three years ago. Phroso and Venus are clearly prosperous, and Madame Tetrallini answers that she is paying expenses. It gives her "children" work, which is better than idleness for the winter. And Cleo is with her. No, not in the music hall, but in the pits, as a freak. She leads the way to a pit, whence comes sounds as of a duck quacking. Cleo’s beautiful legs are gone, and an eye is gone, and her nose is broken crazily, and her face is an expanse of scars. She can only gibber, like an imbecile duck! Venus calls her name, but the duck-girl does not remember. Mother Tetrallini says it is best that Cleo cannot remember. 16. 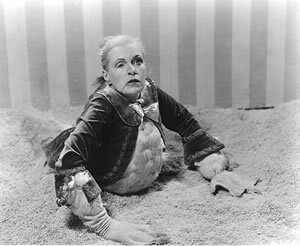 In the version of Freaks which is shown today, there is a noticeable drop in the picture quality of the film, starting with the scene of the duck girl quacking in the pit and following into the tacked-on ending of Hans at his estate, which the duck-girl scene immediately fades into. As of the 1973 Photon article “FREAKS: Re-Evaluating A Screen Classic” by Ronald V. Borst, this tacked-on ending did not yet exist in the circulating prints. So it can be assumed that sometime in the last thirty years, a different print was found that contained the ending, which was then added to the master print. The duck-girl scene, although already in the existing print, would also have been included from the found print because of the fade out/fade in transition into this final scene.